The global financial crisis has seen a strong uptake in non-performing loans (NPLs) in banks’ balance sheets leaving policymakers worldwide concerned by this challenge. This trend has been exacerbated for some countries by the Euro Area crisis, particularly in Southern Europe, resulting in an EU-wide peak NPL ratio of 7.5% in 2012. However, NPL ratio trajectories point to a significant decline across the European Union which can be attributed to enhanced loan selling activities of banks in recent years. In fact, as of 2017, the ratio for the EU stood just below the world average of 3.74%, at 3.7%, which suggests that NPLs are no longer a specific European problem. Cumulative NPLs levels reached a peak of more than €1 trillion in June 2016 across Europe stirring considerable scrutiny in the public sphere and placing pressure on policymakers to act. After 18 months, this amount has been reduced to reach around €800 billion, a nearly 25% reduction. However, a closer look to the composition of total NPLs reveals that only a fraction is really problematic. At end-2017 the largest share of non-performing loans (€329 billion) is found in the category of Group 1 countries which includes major economies such as France, Germany and the UK. Although a large volume in aggregate numbers, the ratios are considered low and not uncharacteristic of the typical functioning of an economy. 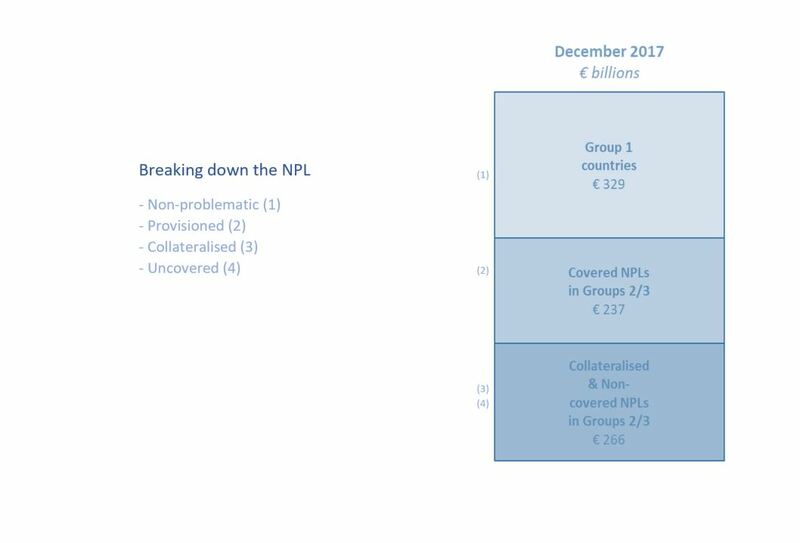 In Groups 2 and 3, nearly half of the NPL amount (€237 billion) is provisioned, meaning that a significant part has already been absorbed by banks. Further an additional chunk of €266 billion contains either collateralized NPLs or non-covered NPLs accumulated in Group 2 and 3 countries. It is estimated that the real problem to tackle is a portion between €150 billion and €200 billion, which are those neither provisioned nor collateralized. In the end, the remaining amount is less than one fourth of the current NPLs stock. On the whole, NPL stocks have decreased considerably in recent years due to fostered NPL disposals: Of the overall NPL disposals of €256 billion between end of 2015 and mid-2017, more than 60% can be attributed to countries of Groups 2 and 3. This has been made possible at growing rates due to several implemented reforms, notably in Group 3 countries where NPL accumulation was largely due to enforcement procedure length. Measures were taken to increase efficiency of insolvency procedures, an important step in the right direction although there still exists room for improvement, as well as to stimulate secondary markets which increased NPL outflow rates and reduced NPL growth. With overall European NPL ratios being below the world average and in view of numerous recently initiated regulations on non-performing loans, including a new provisioning method in IFRS9, disclosure procedures and enhanced supervisory scrutiny in pillar 2, inevitably the question arises whether the objective of improving efficiency in NPL reduction processes can be met through additional burdensome regulations and transaction costs for banks.